The Brioso Trio appeared on Show 274, recorded in August 2013. The Brioso Trio is based at New England Conservatory Preparatory School in Boston, Massachusetts where they are coached by Laura Blustein. 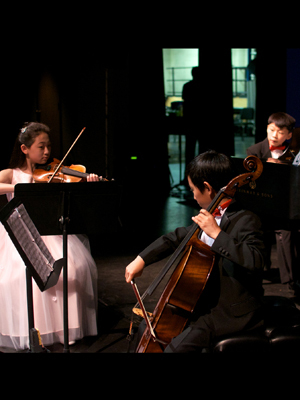 Its members are: 12-year-old pianist Andrew Li from Lexington, Massachusetts, who studies with Dorothy Shi; 11-year-old violinist Hannah Ryu from Lexington, Massachusetts, who studies with Kazuko Matsusaka; and 11-year-old cellist Evan Hsu from Chestnut Hill, Massachusetts, who studies with Laura Blustein.